Agriculture ministers from the G8 called for increased agriculture production as a way to combat world hunger. They together with also representatives from key emerging and developing countries, called for a study into setting up a global system to stockpile essential foodstuffs. In their final declaration, they called on the relevant international institutions to examine whether a system of stockholding would be effective in dealing with humanitarian emergencies or as a means to limit food price volatility. G8 Ministers pledged to use every means at their disposal to lessen the negative impact of the financial crisis on poverty and hunger, to back and encourage sustainable food production and to increase investment in agriculture and research. 28 APRIL 2009 ROME (Pacnews) ---- Food and Agriculture Organisation (FAO) is mobilizing its teams of experts to help ascertain if the new strain of H1N1 virus, which already killed many people in Mexico, has a direct connection to pigs. FAO is also deploying a team of experts of the FAO OIE (World Organisation for Animal Health) Crisis Management Centre – Animal Health (CMC-AH), to Mexico this week to help the government assess the epidemiologic situation in the pig production sector. The UN agency has also requested its technical staff around the world be on full alert, immediately report any influenza-like illness in swine stocks and forward specimens to FAO/OIE reference laboratories. At present, transmission seems to be occurring solely from humans to humans; so far evidence that the new strain of influenza A virus has entered the human population directly from pigs has not been established. Further analysis is planned to gain better insight into the situation. “There is no evidence of a threat to the food chain; at this stage it is a human crisis and not an animal crisis, but we have to be alerted and prepared,” said FAO Chief Veterinary Officer Joseph Domenech. “The first actions FAO and others must take are to ascertain if the new strain is circulating in pigs, establish if there are any direct linkages between the illness in the human population and animals and explain how this new virus has obtained genetic materials from human, bird and pig influenza strains,” he said. FAO is working in close coordination with the World Health Organisation and OIE and other national and international actors involved at all stages of the organization’s operations to ensure maximum efficiency in this worrying turn of events. eGovMonitor, via Global Justice Ecology: At the first global gathering of Indigenous Peoples on climate change, participants were outraged at the intensifying rate of destruction the climate crisis is having on the Earth and all peoples. Participants reaffirmed that Indigenous Peoples are most impacted by climate change and called for support and funding for Indigenous Peoples to create adaptation and mitigation plans for themselves, based on their own Traditional Knowledge and practices. Indigenous Peoples also took a strong position on emission reduction targets of industrialized countries and against false solutions. The majority of those attending looked towards addressing the root problem - the burning of fossil fuels - and demanded an immediate moratorium on new fossil fuel development and called for a swift and just transition away from fossil fuels. …Tom Goldtooth, Indigenous Environmental Network's Executive Director, commented, "We want real solutions to climate chaos and not the false solutions like forest carbon offsets and other market based mechanisms that will benefit only those who are making money on those outrageous schemes " He added, "For example one the solutions to mitigate climate change is an initiative by the World Bank to protect forests in developing countries through a carbon market regime called Reducing Emissions from Deforestation and Forest Degradation or REDD." He concluded, "Don't be fooled, REDD does nothing to address the underlying drivers of deforestation." 27 APRIL 2009 HONIARA (Pacnews) ---- Following discovery of the lethal Asian bees in 2003, Ministry of Agriculture and Livestock (MAL) has immediately embarked on suppressing the bees before they would spread and cause disruption to Solomon Islands’ commercial honey, reports Island Sun newspaper. “Research is continuing as to how best to contain the spreading of Asian bees,” Solomon Islands Permanent Secretary (PS) of Agriculture and Livestock, Henry Pika, revealed last week. Mr Pika said at the moment farmers, particularly on the Guadalcanal plains, are banned from producing honey due to initial discovery of Asian bees at Tenaru. “We fear Guadalcanal farmers might help to spread Asian bees to other places since the bees were initially discovered at Tenaru in 2003,” Mr. Pika said. Based on this understanding, Ministry has temporarily halted production of honey from Guadalcanal plains farmers, Mr Pika confirmed. Mr Pika said there are installments of equipments at sites said to be affected and agriculture officers are monitoring how to contain the spread of it and possibly, a total suppression of it. “Overseas agencies are assisting in terms of provision of specialized equipments to combat the Asian bee,” Mr Pika affirmed. Mr. Pika said Asian bees are highly mobile, therefore, it is important that farmers and the ministry must work together to devise a proper means of stopping them from spreading. “The best we can do is suppressed it,” Mr Pika reiterated. Mr. Pika urged farmers to work closely with the ministry in a concerted effort to suppress Asian bees. Asian bees carry a parasite called “Varon Jacobsoni” that can destroy larva of the commercial honey bee. The destruction of larva can cause negative impact on the overall production of honey. Meanwhile, Mr.Pika also reaffirmed that eradication of giant African snail is still on. This is the third feature in a three-part series on palm oil development in Indonesia. Read Part 1: Global Palm Oil Demand Fueling Deforestation and Part 2: Oil Palm Industry Takes Land, Promises Livelihood. Oil palm plantations yield four tons of oil per hectare, on average. Experts predict that higher yields are necessary for Indonesia to avoid removing wide swaths of its tropical forests.Malaysia-based United Plantations marked the beginning of a new era for the controversial palm oil market last November with its first certified "sustainable" shipment. The organizers invite the offer of papers or posters within the framework â€˜Positive Plant Microbial Interactions in Relation to Plant Performance and Ecosystem Functionâ€™. Accepted papers and posters from the Conference will be published in a volume of Aspects of Applied Biology, which will be available to delegates at the Conference. Selected authors will be encouraged to submit full papers for consideration for publication in Annals of Applied Biology or Plant Ecology and Diversity. Abstracts of papers can be submitted online via our web site at http://www.aab.org.uk. Click on ABSTRACTS in the left-hand column, then the title of Conference. Once you have registered as a user you can upload your details. Please indicate if your offer is for a poster or a platform presentation. Please ensure that your pop up blocker is off, or your offer may not upload. The impact of food insecurity on the Asia-Pacific region and how to deal with it is the focus of an ESCAP study entitled Sustainable Agriculture and Food Security in Asia and the Pacific. The study examines the environmental, economic and social challenges that are the roots of the region’s food insecurity and suggests a regional framework of action to be taken by governments and the international community in order to create greater food security. Place orders for additional quantities of printed copies of free publications by e-mail to ocs@ctahr.hawaii.edu. Wash fresh fruits and vegetables before eating! Aurora Saulo, FST-35, 3 p.
Albert Louie, FST-36, 2 p.
Mark Thorne, Linda Cox, Glen Fukumoto, PRM-5, 8 p.
Trees can offset your carbon footprint and make you greener! 16 APRIL 2009 APIA (Pacnews) ---- After several years of planning and preparation, a US $13.1million climate change adaptation project is now underway in the Pacific region. The Pacific Adaptation to Climate Change (PACC) project is funded by the Global Environment Facility (GEF) with the United Nations Development Programme (UNDP) as its implementing agency and the Secretariat of the Pacific Regional Environment Programme (SPREP) as implementing partner. The project is scheduled to be conducted from 2008 to 2012. Under the project, Fiji, Papua New Guinea and the Solomon Islands will focus on food production and food security. Cook Islands, Federated States of Micronesia, Samoa and Vanuatu are developing Coastal Management capacity and Nauru, Niue, Tonga and Tuvalu are looking at strengthening their water resource management. “The Pacific countries have continued to indicate at the regional and international forums, the problems they are already facing from climate change, like salination of underground water, inundation of low lying areas and coastal erosion," said Taito Nakalevu of SPREP, who began his new role as the PACC Project Manager on 6 April. “These are already impacting on the livelihoods of our Pacific people and the very resources they actually depend on. This project is part of the answer to help assist them in addressing this problem,” Mr Nakalevu added. An inception workshop for the region wide project will be staged in June to build the capacity for countries to be able to fulfil the administrative requirements of the Project and to introduce other technical backstopping support. Mr Nakalevu is currently working with countries bilaterally to help establish project management units that will coordinate PACC on the ground in the Pacific. A food policy council (FPC) brings together stakeholders from diverse food-related areas to examine how the food system is working and propose ways to improve it. A FPC may be an official advisory body on food systems issues to a city, county, or state government, or it may be a grassroots network focused on educating the public, coordinating non-profit efforts, and influencing government, commercial, and institutional practices and policies on food systems (WHY 2008). A good example is the Toronto Food Policy Council in Canada, which has served as a leader in the worldwide movement to create such councils (Toronto 2008). The idea is catching on. Googling on Food Policy Council yields about two million hits, and Food Security Council yields a similar number. Most are in the United States, but they could play important roles anywhere, including less wealthy countries and communities. They could be organized and operated in many different ways. Suggestions are offered here on the design and operation of these councils, but of course adaptations would be have to be made to accommodate specific local circumstances and interests. The councils are commonly referred to as Food Policy Councils (FPCs), but some are called Food Security Councils or Nutrition Policy Councils. No matter what their names might be, they should deal with all aspects of food and nutrition in a comprehensive way. They should provide a locus for providing sustained attention to, and dialogue on the issues, and for providing recommendations to relevant policymakers. If food sovereignty is taken to mean the right of all people to participate in the shaping of food policy, then FPCs could be understood as a locus for its exercise. Here, food sovereignty means that everyone has a voice, and no one may exclude others or claim priority over others. Perhaps a better term would be food democracy. FPCs may be governmental or quasi-governmental. Where governments do not provide a mandate for creating FPCs, local people could organize them on their own initiative. Food Policy Councils span the usual boundaries of governmental agencies, cutting across the usual “silos” of governance (the separate ministries and departments), and providing a place for much needed dialogues. They should operate on the basis of openness and broad participation, and operate democratically, grounding their recommendations mainly on clear analysis and compelling principles. FPCs should facilitate dialogue on nutrition-related activities not only horizontally, across particular levels, but also vertically. FPCs could be organized in layers, with small FPCs in local jurisdictions (e.g., cities, villages), medium-sized ones at intermediate levels (e.g., states, provinces), and larger ones at the national level. There could also be regional ones, housed in appropriate regional organizations. There could be one at the global level as well. At the global level, the Committee on World Food Security based in the Food and Agriculture Organization of the United Nations, and also the United Nations System Standing Committee on Nutrition, have roles comparable to those of FPCs. FPCs at different levels would work differently, but with good coordination among them they could complement and support one another. The FPCs at higher levels should not provide instructions to those at the lower levels, but should provide support services such as technical advice and coordination services according to the wishes of the lower level FPCs. The ones at lower levels could provide information and recommendations to those at higher levels. This layering has not yet been worked out in an orderly way anywhere, but the potential is there. Food availability in a country, region or local area means that food is physically present because it has been grown, processed, manufactured, and/or imported. Food access refers to the way in which different people obtain available food. Normally, food is accessed through a combination of means. This may include: home production, use of left-over stocks, purchase, barter, borrowing, sharing, gifts from relatives, and provisions by welfare systems or food aid. Food utilization is the way in which people use food. It is dependent upon a number of interrelated factors: the quality of the food and its method of preparation, storage facilities, and the nutritional knowledge and health status of the individual consuming the food (International Federation 2007). The challenge is not simply to ensure adequate food supplies, but to ensure that everyone is well nourished. Thus, attention needs to be given not only to food supply but also to issues such as eating habits and child feeding. The overall objective should be to ensure good nutrition for all, under all conditions. These bodies could be called Nutrition Policy Councils to highlight the point that they are concerned with nutrition in all it dimensions, and should not limit their focus to food supplies. The FPCs main task would be to give recommendations and to facilitate the operations of other agencies, and not to undertake field operations themselves. They would not have a fixed pot of money to allocate, but their recommendations could influence the allocations made by others. Similarly, the pool of human resources that are available is not fixed, but could grow in response to the FPCs’ encouragement. The people who are drawn in to work on improving infant feeding practices, for example, would be different from those who want to promote homestead food production, and they would draw from different pools of resources. Participants in FPCs would be expected to have a shared high level goal, the assurance of good nutrition for all people under all conditions. However, as a diverse group, the participants would have different interests in how to approach it. Different interests do not necessarily mean conflicting interests. The assumption here is that malnutrition must be addressed on many fronts at once, and there needs to be a division of labor in doing that. FPCs should facilitate all approaches, and help the groups that are involved to harmonize their work. Agriculture and fisheries are important means for maintaining livelihoods for the producers and for meeting nutritional needs of consumers. This Task Force would focus on the contributions of agriculture and fisheries, and also food imports, to the nutrition of local people. It should cover not only commercial operations but also homestead food production and non-commercial food harvesting in natural settings. It could promote community gardens of various forms. The Task Force should give special attention to the need for a balanced mix of local production, imports, and exports, giving attention to costs, environmental concerns, and vulnerability to changing circumstances. The Task Force on Nutrition and Health would consider ways in which diets could be modified to improve people’s health. It would give attention to all nutrient needs, and give special attention to problems of excess fat, sugars, and salt. It would propose policies that would help to reduce overweight and obesity, and thus reduce associated non-communicable diseases such as diabetes, heart disease, and cancer. This Task Force would consider the needs of particular groups such as infants and young children, people with low income, people who are disabled, and the elderly. It would also give attention to the nutrition of people in schools, hospitals and prisons. In addition to its discussions with various agencies, this Task Force should discuss the issues directly with these vulnerable people and their representatives. Some should be included in the Task Force. This Task Force would monitor and propose means for improving food safety in all contexts, including markets, restaurants, and homes. The ability of natural or human systems to survive in the face of great change. To be resilient, a system must be able to adapt to changing circumstances and develop new ways to thrive. In ecological terms, resilience has been used to describe the ability of natural systems to return to equilibrium after adapting to changes. In climate change, resilience can also convey the capacity and ability of society to make necessary adaptations to a changing world -- and not necessarily structures that will carry forward the status quo. In this perspective, resilience affords an opportunity to make systemic changes during adaptation, such as addressing social inequalities (Worldwatch 2009). On this basis, the FPC Task Force on Resilience should focus on food and nutrition issues under possible future changes in conditions, including both rapid changes such as disasters, and slower changes such as climate change or price inflation. This would include possible changes in policies of various external agencies. The Task Force on Legislation would work with all the other Task Forces in the preparation of comprehensive laws and regulations regarding food and nutrition. This would include establishing a clear framework of rights, obligations, and accountability. The Task Force on Monitoring and Reporting should support each of the other Task Forces in preparing their annual reports, and also use those reports to prepare an annual FPC report to the government and the public at large. All of the Task Forces should report on nutrition issues in their particular domains, describe the status of implementation of their past recommendations, and describe their impacts. The comprehensive annual report from the FPC to the government and to the community is an important tool for sustaining public attention to the major nutrition security issues. It should set the agenda for future work, not only for the FPC, but also for the government and for the community as a whole. These Task Forces could be combined and renamed in various ways. However, it is important to assure that all important issues related to food and nutrition are given attention by at least one of the FPC’s Task Forces. The titles and descriptions of the Task Forces could be modified to align with the functions of the relevant departments of government, and possibly nongovernmental organizations as well. Each Task Force should have its own agenda that it works on continuously, perhaps with different subgroup addressing particular issues. While the leaders of these Task Forces should be members of the FPC, their members could be drawn from the local community, in accordance with their special interests. It would be important to get representation from diverse sectors of the community. In some cases Task Forces might create temporary Working Groups to deal with specific issues. FPC Task Forces could organize their efforts into an ongoing cycle of steady improvement, based on three distinct phases of work: describing existing food systems, critically assessing them, and, based on these foundations, improving them. FPCs could serve any defined place in which people live, such as villages, cities, islands, territories, prisons, countries, or regions. Their first job would be to understand the place’s current food system. Information should be collected about patterns of food production in that place, and its imports, and exports. Attention should be given not only to foods that are marketed, but also to homestead food production, foods that are harvested in nature, and locally bartered or gifted food. Prevailing “food ways” should be described, regardless of whether they are judged to be good or bad. This account should distinguish ways of feeding special groups such as children, the elderly and the ill, and it should also describe what is usually done when food supplies fall below their normal levels in terms of quantity or quality. In some places, attention should be given to the ways in which the shift from traditional to modern foods might have affected people’s well-being. In this descriptive phase of the work, the focus would be on what is the case. Attention would be given to what could be or should be in later phases. In describing local food situations, it is important not to limit attention to aggregates and averages, especially where there is great diversity. The conditions of the general population, or what might be called its middle class, are likely to be very different from the conditions of those who are especially poor or who are marginalized in other ways. The middle class may be doing quite well, but there is always a less visible group that has difficulty getting adequate food on a regular basis. The undernutrition of those who are marginalized makes them especially vulnerable to serious infectious diseases. Nutrition concerns are not only about the needs of people at the bottom. There may be a middle class group that is significantly malnourished, demonstrated mainly by overweight and obesity. This often results in serious non-communicable diseases such as heart disease, cancer, and Type 2 diabetes. There are also concerns about child feeding practices, food safety, and the need for reliable food supplies in emergency situations. All of these issues need to be considered. The study of food systems should include a review of the legal and policy frameworks that shape them. What are the roles of local government, national government, local businesses, multinational corporations, etc.? What roles do regional and global organizations play? Government-sponsored social service programs, including those not centered on food, might play a significant role in assuring good nutrition for all. Similarly, remittances of money from abroad might have an important influence on the local nutrition situation. It is important to understand the legal status of the place under study. What is the role of higher levels of governance on the local nutrition situation? Who gets to make what decisions? How are those decisions made? Within that legal framework, one should ask wehther people have clear legal rights relating to food and nutrition, whether the corresponding obligations of the relevant agencies are clearly spelled out, and whether there are there effective mechanisms of accountability in place to assure that those obligations are carried out properly (Kent 2005). Assessment is the task of determining whether the patterns that have been described should be judged as good or bad, with emphasis on the question, what needs to be improved? Views may differ, depending at least in part on how the viewer is positioned in the system. The person who runs the local food market is likely to see the advantages of importing food more clearly than the disadvantages, while health workers take the opposite stance. Sometimes discussion can lead to agreement on more nuanced assessments. Maybe it is only the imports of particular foods that are problematic. In some cases the linkages between food distribution patterns and malnutrition may not be obvious. The harms that follow from bad diets are not immediately evident. The linkages may need to be explained, based on solid evidence. Food systems should be assessed to determine how well they serve various subgroups. It might be found that people in the urban center do better on some aspects of food security while those in more remote areas do better on others. There might be some people whose income is so low that they cannot manage on their own and need help. There might be some groups that suffer from discrimination and thus cannot provide for themselves adequately. Young children might show signs of malnutrition, perhaps by being underweight or short compared to the norms for their age and gender. In addition to looking at how well food systems operate from day to day in normal times, it is important to also ask how resilient the system would be under various kinds of shocks. What would happen if the trucks or ships that normally bring in food did not come? What would happen if the local food supply were to be contaminated, whether accidentally or deliberately? What would happen if some sort of disease or climate disturbance interrupted local food production? There is a need to consider how the system would cope with sudden disturbances and also with slow disturbances. There are possibilities not only for tsunamis but also for slow sea level rise. Fuel prices could increase slowly and steadily to the point that imported foods become unaffordable. How would the existing food system deal with such contingencies? Attention should be given to how local and higher levels of government might—or might not—assist under various contingencies. What would happen if some current support programs, such as social welfare programs, were to be discontinued? Such changes in policies might seem unlikely, but the possibility cannot be excluded, especially during times of economic stress. If there were sudden and serious food shortages in the place under study, what would the different layers of government do to help? What would private agencies do? Are the answers based on assumptions or written agreements? What is there to assure that written agreements will be honored, especially under difficult conditions? What stocks of food are maintained in the place under study? How long would they last if supplies from outside were cut off? What policies are in place to manage the stocks under the various difficult contingencies that could be imagined? Systematic assessments help in identifying the ways in which food systems need improvement. What are the current food and nutrition problems? What are the vulnerabilities regarding future contingencies? In addressing these questions, there are might be serious cultural issues that must be addressed. Work on strengthening local food security should begin with identification of the main issues that need to be addressed. This should be done in close consultation with the local population, with other levels of government, and with outside experts. Many different kinds of improvement should be considered. Some don’t require detailed prior analysis to justify them. For example, knowledge about how to produce food around the home could be encouraged simply by arranging to have people with experience in homestead food production share their knowledge with others who are interested. Simple things like that don’t cost much and do not involve any serious risks. In many places there is excessive consumption of fat, sugar, and salt. Things could be done to make fatty, sugar, and salty foods less available, and healthier foods such as fruits and vegetables more readily available. Health-based pricing could be used, taxing bad foods and subsidizing good foods. In New York City, it is now illegal for restaurants to use trans-fats. In Samoa, importing fatty turkey tails is now prohibited. Various jurisdictions are considering ways to limit salt intakes (Economist 2008). The governor of New York State has proposed a special tax on sugary drinks. Efforts are underway worldwide to control food and beverage advertising that is targeted to children (International Obesity Task Force 2008). Some interventions might go against ingrained food habits, but when health problems become serious enough, it makes sense to press for changes in those habits. As a global public health recommendation, infants should be exclusively breastfed for the first six months of life to achieve optimal growth, development and health. Thereafter, to meet their evolving nutritional requirements, infants should receive nutritionally adequate and safe complementary foods while breastfeeding continues for up to two years of age or beyond (WHO 2003). Child feeding practices are sub-optimal in many places. One of the simplest and cheapest methods for improving child health would be to improve breastfeeding practices. Several organizations have developed good programs for doing that. Attention should be given to the most glaring weaknesses of the food system, but at the same time thought should be given to ways in which the overall system might be strengthened. For example, methods might be found to help policymakers track its current status. If policymakers want to ensure continuing improvement in nutrition status, they should monitor it. Various tools could be used for that purpose, as suggested in the United States Department of Agriculture’s discussion of food security measurement (USDA 2008). The Food and Agriculture Organization of the United Nations has a Special Programme for Food Security that offers a variety of resources on the issue (FAO 2008). These agencies offer many good ideas, but they would have to be adapted for the situations in the location of concern. Collecting new data could be expensive and difficult to sustain over time. FPCs should make full use of data that are already collected on a regular basis. Public health data generally include indicators that relate to nutrition status. In some cases the regular data gathering practices might be adjusted to gather more nutrition-related information. A few approaches to nutrition issues have been mentioned here for illustrative purposes. Each Task Force should dig deeply, locally, nationally, and globally, for the best knowledge and ideas relating to the concrete issues that they address. In many places, there is little systematic attention to local food systems and their impacts on people’s nutrition, and practically no planning for them. Yet these systems always need improvement. The issues will not be dealt with adequately if policymakers imagine that they can simply undertake a burst of activity and finish the work. Moreover, no locality should rely on outside agencies to look after its nutrition situation. No one has as much concern for the well-being of local people as they themselves do. Without that, the issues are likely to be neglected, and forces of change that originate elsewhere will shape local conditions. Thus, there is always a need for a central place in which nutrition issues could get the attention they require. Every locality should have a Food Policy Council, a permanent, broadly representative, well-supported agency whose primary responsibility is to ensure steady improvement in nutrition in all its dimensions. Creating such a council could be the single most important action taken to ensure good nutrition for all over the long run. Worldwatch 2009. “Climate Change Reference Guide and Glossary.” In State of the World 2009: Into a Warming World. Washington, D.C.: Worldwatch Institute. Papua New Guinea requires a multi-pronged strategy to adapt to climate change and mitigate its impacts on agriculture and food security in the country. NARI Director-General Dr Raghunath Ghodake says PNG must look after its own interests against the backup of global uncertainty and financial recession now that the world is going through global climate change along with food shortages and the worldwide economic crisis. Speaking at the 19th National Agriculture Council meeting in Madang on March 24, 2009, Dr Ghodake said the phenomenon of climate change is a definite process and is a fact of life with a complex manifestation in terms of its impacts on agriculture and food security and PNG has to prepare and adopt a multidimensional strategy. He therefore called on the public sector and donor agencies to participate and help support the development and implementation of medium to long term efforts in this area. In his joint paper with Dr John Bailey on ‘Challenges of Climate Change on Agriculture and Food Security and Strategies to Reduce Impacts in Papua New Guinea’, Dr Ghodake said PNG, situated on the western rim of the tropical pacific, is already suffering from the effects of rising sea levels, which have eroded land and contaminated water supplies, to the extent that some small island communities have already had to evacuate. He said the country is also vulnerable to extremes in rainfall intensities linked to La Nina Southern Oscillation events. He said warmer and moister conditions, which climate models predict for the humid tropics, are likely to increase threats to food and cash crop production posed by pests and diseases. Already there appears to be an intensification of pest and disease problems in PNG, including those caused by late blight on potato and leaf scab on sweet potato, said Dr Ghodake. “Warmer temperatures are also causing increased incidences of malaria in the PNG highlands”. Dr Ghodake also highlighted that in response to the threat of climate change, a series of projects are being jointly implemented and/or developed by various Australian and PNG institutions and NARI. He said the strategy associated with the projects has five main parts which tackle different aspects of the climate change problem in PNG. They include early warning system, crop and genotype diversification, biotechnology targeting of pests and disease, dissemination and adaptation of drought-coping strategies, and sustainable water supply. Dr Ghodake said PNG must take the initiative and urgently address the imminent impacts of climate change on the nation’s food and water security, and in particular the need to put in place sustainable water supply facilities for vulnerable rural communities. He also stressed that PNG must make a strategic investment by accepting and implementing agriculture as a development agenda for the well-being of the people and prosperity of the nation. The annual Agricultural Innovations Show will be staged at NARI’s Sir Alkan Tololo Research Centre at Bubia, Morobe, on May 5, 2009. This will be the third year of this “information exchange and knowledge sharing” event in which partner and collaborating organisations in agricultural and rural development will display and exhibit their innovations and improved technologies and interact with farmers and the general public. The theme for this year’s occasion will be “Adapting PNG Agriculture to Climate Change”. The Chief Guest will be the Minister for Higher Education, Research, Science and Technology, Michael Ogio. Other specially invited dignitaries are also expected on the one-day occasion. All NARI research programmes throughout PNG will demonstrate and disseminate many of their new and improved research innovations, technologies and information. Among them will be research activities and outputs on food crops, emerging food and cash crops, stallholder livestock and resource management issues. Farmers will have the opportunity to see live plant specimens and learn from posters and other publications. The new Alan Quartermain Multi-purpose Hall at Bubia will be the arena of the occasion and will be open free to the public. The potential for large-scale commercial production of cellulosic biofuel will have unprecedented impacts on the forest sector," the report indicates. A general concern is that some governments may dilute previously ambitious green goals or defer key policy decisions related to climate change mitigation and adaptation as they focus on reversing the economic downturn," the report reveals. They are causing the destruction of forests elsewhere," said Simone Lovera, managing coordinator of the Global Forest Coalition. The dual challenges of economic turmoil and climate change are bringing the management of forests to the forefront of global interest," observes the FAO. In addition to a price on the carbon emissions from deforestation, other and stronger protection measures will still be needed," said Martin Persson, a Swedish researcher and expert in rainforests recently. Biodiversity loss and ecosystem degradation have led to economic losses which dwarf the losses of the current financial crisis. Biodiversity loss involves high risks and irreversibilities for current and future generations. Adequate attention must therefore be given to questions of whose values count and how to take these values into account. The “economic compass” is not defective but works in the way it has been designed, based on a simple mechanistic view of man interacting with nature, excluding the complexities of both. Biodiversity loss cannot be solved in the framework of an economic system which defined the very rules and incentives which caused it. Market failure is just one reason for biodiversity loss along with institutional and policy failure. The economic values of ecosystems and biodiversity therefore need to be socially contextualized by integrating them in societal decision-making systems which are part of the policy process. It is not only since the Millennium Ecosystem Assessment Report that we are aware of the negative consequences of biodiversity loss and ecosystem degradation. The Millennium Assessment, however, has brought the topic back to the top of the agenda of public concern. Those 150 countries that have ratified the Convention on Biological Diversity (CBD) are especially concerned. They signed up to conserve, sustainably use and share the benefits of using the earth’s biodiversity. Re-defining the relationship between man and nature, by other than only economic value articulating institutions, will allow for the accounting of other than just monetary values and designing an economy which takes man’s and nature’s household into account beyond mere chrematistics. Deliberative decision tools, like citizen juries and roundtables, are complementary to economic and multi-criteria decision support tools and enable society to engage in stewardship strategies for biodiversity loss, guided by norms and principles. Promoting optimum nutrition is a key goal for supporting people as they age. However, it is critical to first acknowledge the roles and value of food to those we wish to nourish - Nutrition may not be at the top of their list. * 45% said that their budget limited the variety of food they could choose to buy. For Maori, these issues are often of far more concern than optimum nutrition, so those promoting healthy nutrition must acknowledge the overriding relationship Maori have with food, acknowledge the mana of Kaumatua, and work with the whole whanau. Healthy Lifestyle Coach, Ranui Hapi, and Green Prescription Coordinator, Amiria McGarvey, explained that promoting healthy lifestyles to Kaumatua and Kuia requires an understanding of Te Ao Maori and its value system. Ranui’s presentation focused on her guiding principles of humility, reciprocity, openness and flexibility in building a relationship with older Maori. Again the emphasis was on involving the whole family in healthy eating. Amiria has developed a Green Prescription physical activity programme for Kaumatua that takes account of the traditions from Te Ao Maori. As well as keeping the message simple, everyone, including the instructors, participates together: “Nau te rourou, naku te rourou, ka ora ai te Iwi” - From your contribution and my contribution, the people will be well. Pacific people likewise have a holistic notion of health and it is a family and community concern, rather than an individual matter. Soana Muimuiheata, a Pacific (Tongan) dietitian working in the Counties Manukau area, told seminar participants that food is central to all Pacific cultures. “For many Pacific people, the value of food is context-specific - from a resource of simple sustenance through to a symbolic observation of respect, love and appreciation, hospitality and the honouring of guests” said Soana. Food is something to enjoy rather than a source of nutrients. Barriers to achieving optimum nutrition are based around priorities of tradition, beliefs, family and community obligations. Therefore, when promoting optimal nutrition, it is important to target the whole households and provide practical recommendations taking into account the family socio-economic situations. Over 130 people attended the seminar - the latest in a regular stream of events offered by the Nutrition Foundation. Previous seminar topics have included barriers to good nutrition in older people and the prevention of falls and injury. The New Zealand Nutrition Foundation is a non-profit organisation which works pro-actively in the nutrition and food sectors with the food industry, Ministry of Health, other health promotion agencies, schools and the media. Its mission is “to enhance the quality of life of New Zealanders by encouraging informed, healthy and enjoyable food choices.” This seminar was arranged by the Foundation’s Committee for Healthy Ageing, in partnership with Te Hotu Manawa Maori, the Pacific Island Food and Nutrition Advisory Group and the Auckland branches of the New Zealand Dietetic Association and the New Zealand Association of Gerontology. New York, Apr 2 2009 5:10PM Some 500 participants gathered in Paris today to begin talks aimed at finalizing a pact which will allow international researchers and scientists access to plant and animal genetic resources, in compliance with the United Nations Convention on Biological Diversity (CBD). The CBD had a 2010 target date for achieving a significant reduction in the rate of loss of the world’s plant and animal species at the global, regional and national level, and is the international framework for the conservation and sustainable use of biodiversity and the equitable sharing of its benefits. The CBD, which is signed by 191 States, recognizes the sovereignty of nations over their natural resources, and parties to the Convention have the authority to determine physical access to genetic resources in areas within their jurisdiction. Parties also have the obligation to take appropriate measures to ensure the sharing of benefits derived from the use of their genetic resources. Access to these resources in exchange for the fair and equitable sharing of benefits can contribute to further research and development with a positive impact on human well-being through the use of genetic resources in pharmaceuticals, cosmetics, agriculture among other sectors. The seventh meeting of the Ad Hoc Open-ended Working Group on Access and Benefit-sharing, which concludes on 8 April, is the first of three mandated by the Conference of the Parties to the CBD to finalize the negotiation of the international regime before their next meeting in October 2010 in Nagoya, Japan. County Council Member Bill Medeiros has introduced a bill banning genetically engineered or modified taro in Maui County. The proposal received strong support Friday from Native Hawaiians, taro farmers and critics of GMO technology when it was introduced at the regular Maui County Council meeting. It was referred to committee for future discussion. Proponents of developing genetically modified taro have said research could help the plant resist modern pests and diseases. But critics said genetic experimentation still hasn't been proved to be safe, and natural strains of the plant could be contaminated through pollination. They also point out taro's cultural and spiritual significance to Hawaiians. "That's sacred," said taro farmer Alex Bode. "Leave our taro alone." The environmental issues affecting taro farmers won't be solved by genetic modification, he added. "It's a sacred, perfect food," said advocate Angie Hoffman. "It just needs good soil and water." She added that there haven't been enough studies done to show genetic modification is safe. Maui Nui Botanical Gardens Executive Director Lisa Schattenberg-Raymond said developing genetically modified strains of taro would create a "Pandora's box" because farmers couldn't prevent the new types from cross-pollinating with their pure, traditional varieties. 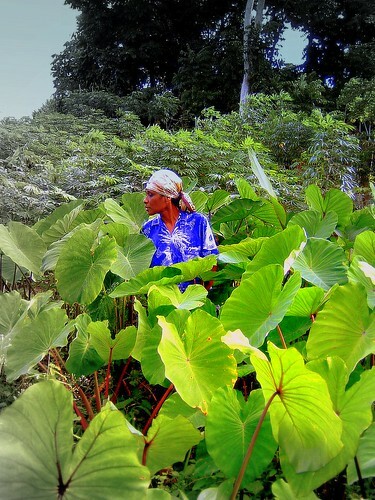 "Any genetic modification of kalo (taro) is a threat to Native Hawaiian resources," she said. The loss of their specialised knowledge of nature is a grave concern for many indigenous communities throughout the world. Education, as it is understood in a Western context, occupies a pivotal role in this process, highlighted by many as both a major cause of the decline of indigenous knowledge, and also as a potential remedy for its demise. Commendable efforts are being made to better align educational curricula with indigenous realities and to incorporate local knowledge and language content into school curricula, but the interrelationship and balance between these two different ways of learning remain delicate. These issues, and attempts to address them, are explored within the UNESCO publication Learning and Knowing in Indigenous Societies Today. The book is organised into three sections. The first addresses the link between indigenous knowledge and indigenous language, and explores the opportunities this interconnection provides for understanding and countering declines in both. The second section examines how the loss of indigenous knowledge due to insensitive school programmes may be countered by integrating indigenous knowledge and languages into school curricula. The third section explores the need for the revitalisation of indigenous ways of learning, generally outside of a classroom environment, and how this may be practically viable in modern contexts. The book will be launched on 2 April 2009 in Bonn, Germany, on the occasion of the ‘UNESCO World Conference on Education for Sustainable Development - Moving into the Second Half of the UN Decade’ (31 March - 2 April 2009). This conference takes place five years into the UN Decade of Education for Sustainable Development (DESD) for which UNESCO is the lead agency. UNESCO, 2009, Learning and Knowing in Indigenous Societies Today. Edited by P. Bates, M. Chiba, S. Kube & D. Nakashima, UNESCO: Paris, 128 pp. De nombreuses communautés autochtones à travers le monde s'inquiètent sérieusement du risque de perdre leurs savoirs spécifiques sur la nature. L'éducation, prise dans un contexte occidental, occupe un rôle pivot dans ce processus de disparition. Elle est décrite par beaucoup à la fois comme la raison majeure du déclin des savoirs autochtones, mais aussi comme un remède potentiel à leur disparition. Des efforts louables sont déployés pour mieux harmoniser le curriculum éducatif avec les réalités autochtones, ainsi que pour incorporer les contenus des savoirs et langues autochtones dans le curriculum scolaire. Mais l’équilibre entre ces deux formes distinctes d'apprentissage reste délicat à trouver. Ce sont ces questions et la manière de les aborder qui sont explorées dans la publication de l'UNESCO intitulée "Learning and Knowing in Indigenous Societies Today" (L'apprentissage et les savoirs dans les sociétés autochtones d'aujourd'hui). L'ouvrage est divisé en trois sections. La première aborde le lien entre savoirs autochtones et langues autochtones et explore les opportunités offertes par cette interconnexion pour comprendre et empêcher leur disparition. La deuxième section examine comment lutter contre la perte des savoirs autochtones causée par des programmes scolaires inadaptés et propose d'intégrer les savoirs et langues autochtones dans le curriculum éducatif. La troisième section explore le besoin de revitaliser les formes d'apprentissage autochtones qui ont généralement lieu en dehors des salles de classe, ainsi que la manière dont ils pourraient être appliqués dans un contexte moderne. Le lancement du livre aura lieu le 2 avril 2009 à Bonn, en Allemagne, à l'occasion de la "Conférence mondiale de l'UNESCO sur l'éducation pour le développement durable – S’engager dans la seconde moitié de la Décennie" (du 31 mars au 2 avril 2009). Cette conférence a lieu à mi-parcours de la Décennie des Nations Unies pour l'éducation au service du développement durable (2005-2014 , DEDD), pour laquelle l’UNESCO est l’agence chef de file. UNESCO, 2009, Learning and Knowing in Indigenous Societies Today.Compilé et révisé par P. Bates, M. Chiba, S. Kube & D. Nakashima, UNESCO: Paris, 128 pp. The United Nations Environmental Program (UNEP) announced that it will implement a new initiative, to better protect bees, bats, birds and others that are vital to crop development, production and biodiversity. The plan is for five years and is costing US$26 million, it will reintroduce natural pollination, that has been killed off, by the use of insecticides and fertilizers. The scheme is being financed, by the Global Environmental Facility(GEF) and coordinated by FAO. This is good news for Argentina, who is the world’s largest producer of honey.